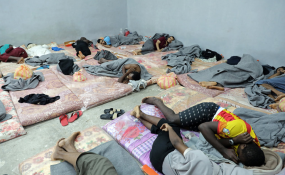 "Amid the ongoing clashes, IOM staff in Libya coordinated very closely with Libyan authorities to ensure the safe arrival of all migrants coming from different detention centers and different urban areas in Tripoli to Mitiga airport. The airport was briefly affected by the armed conflict this week, but later resumed activity - as I said, only between the hours of 7 p.m. and 7 a.m. every day," Millman said. "Of course, any insecurity that arises from violence or weather or anything else will upset that well-oiled machine. But I guess, to reiterate what I said at the beginning, the fact that we did it now in this climate indicates we intend to do it whenever we can," he said.